What Are The Negative Health Effects Of Polychlorinated Biphenyls? 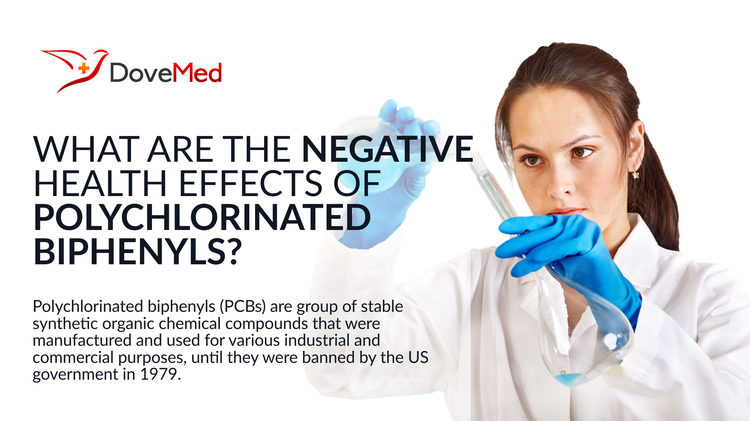 Polychlorinated biphenyls (PCBs) are group of stable synthetic organic chemical compounds that were manufactured and used for various industrial and commercial purposes, until they were banned by the US government in 1979. Polychlorinated biphenyls (PCBs) are group of stable synthetic organic chemical compounds that were manufactured and used for various industrial and commercial purposes, until they were banned by the US government in 1979. Their versatile physical and chemical properties resulted in PCBs being used for wide-ranging applications that included the use in various paints, dyes, inks, and pigments, electrical components, plastics and rubber, hydraulic equipment, and in many other products. However, PCBs are also environmental contaminants with slow absorption and metabolism rates. Studies conducted in 1984 established their half-life to vary between 1 and 71 years, depending on the PCB type. Human PCB exposure occurs through polychlorinated biphenyl contaminated food, air, and water, and also through vertical transmission from a mother to the unborn child (transplacental exposure). The types of PCBs dictate their absorption, storage, and excretion in humans. Studies on animals have shown that PCBs may adversely affect various body systems, such as the nervous system, reproductive system, endocrine system, and immune system, besides causing cancer. Per the journal Environmental Health Perspectives, PCBs may cause immune system suppression in humans and make them increasingly prone to non-Hodgkin’s lymphoma if they are infected with Epstein-Barr virus. A study in 2004, which examined increased exposure to PCBs through fish consumption, showed women having preterm deliveries and low birth weight babies potentially due to the increased PCBs in fish, with the severity of exposure having a strong correlation with the gestational period. A study published in the journal Annals of Agricultural and Enviornmental Medicine showed that PCBs may acutely affect the development of the nervous system and cause memory problems, visual recognition and learning difficulties, and induce ADHD-like symptoms (inattentiveness and lack of alertness). Ongoing research has established that polychlorinated biphenyls can disrupt functioning of the endocrine system, notably the thyroid gland. Hormonal deficits in humans can lead to many health conditions, though research is currently underway to directly link PCBs to such disruptions. The EPA and other agencies, like the National Toxicology Program and International Agency for Research on Cancer, inform that PCBs may be potentially carcinogenic to humans. Industrial workers exposed to this potential carcinogen have been observed with cancers of the liver and skin (malignant melanoma), though a clear association between both cancer and PCB is yet to be conclusively established to determine if it is indeed a health hazard. Yakushiji T, Watanabe I, Kuwabara K, Tanaka R, Kashimoto T, Kunita N, Hara I. Rate of decrease and half-life of polychlorinated biphenyls (PCBs) in the blood of mothers and their children occupationally exposed to PCBs. Arch Environ Contam Toxicol. 1984 May; 13(3):341-5. Nordström, M., et al. 2000. Concentrations of Organocholorines Related to Titers to Epstein-Barr Virus Early Antigen IgG as Risk Factors for Hairy Cell Leukemia. Environmental Health Perspectives 108:441–445. Jurewicz, J., Polanska, K., & Hanke, W. (2013). Chemical exposure early in life and the neurodevelopment of children-an overview of current epidemiological evidence. Ann Agric Environ Med, 20(3), 465-86. Ballschmiter, K., & Zell, M. (1980). Analysis of polychlorinated biphenyls (PCB) by glass capillary gas chromatography. Fresenius' Zeitschrift für analytische Chemie, 302(1), 20-31. Borja, J., Taleon, D. M., Auresenia, J., & Gallardo, S. (2005). Polychlorinated biphenyls and their biodegradation. Process Biochemistry,40(6), 1999-2013. Letcher, R. J., Klasson-Wehler, E., & Bergman, A. (2000). Methyl sulfone and hydroxylated metabolites of polychlorinated biphenyls. In Volume 3 Anthropogenic Compounds Part K (pp. 315-359). Springer Berlin Heidelberg.